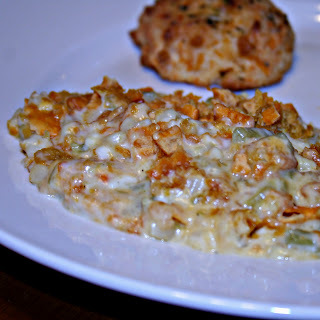 I have discussed my love for comfort food numerous times on here, and this recipe is just another example of a food that is pure comfort in a casserole dish. A tweaked version of a classic Green Bean Casserole that I have no idea of the original source, but I do remember the first time my mom made it when I was in high school or college. She made it for Thanksgiving dinner in lieu of a traditional Green Bean Casserole - just for something a little different. I wasn't sure how I felt about it at first because I could take or leave corn, but I've been hooked since the first bite. Green Beans, corn, sour cream, cheese... all the makings of a delicious casserole-style side dish, that admittedly I often made as dinner in college. When I lived by myself I would make this and live off it for a few days. My mom hasn't made it in awhile, but she makes hers a little differently than I make mine. 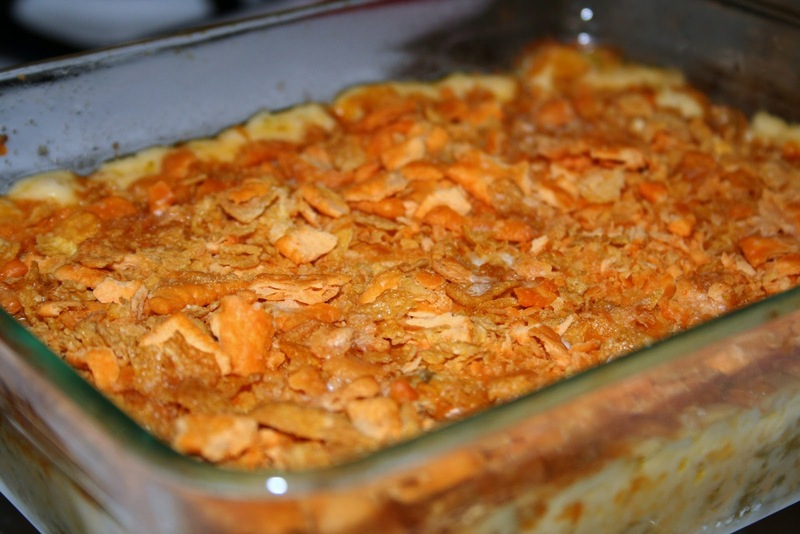 Her's is even more of a traditional Green Bean Casserole using French Fried Onions on top, whereas I pull out my ever present box of Reduced Fat Cheez-Its from the pantry and crush those bad boys on top! Not the healthiest meal in the world but what comfort food really is all that healthy (besides some soups)?! Eventually I will probably try making this without the cream soup, but for now I'm sticking with the recipe I know by heart, which includes Cream of Celery Soup. I try not to use it that often, but I do always have a can in the pantry in case I'm ever craving a casserole type dish and don't have the ingredients on hand to make it with a cheese sauce instead. This recipe is freezer friendly. I like to make 2 small batches at a time. One in a smaller baking dish, the other in an 8x8 disposable foil pan. I prepare just until baking and put in the foil pan. Cover with two layers of foil, label and place in the freezer. Just thaw in the fridge during the day, or the night before, you plan on baking it. Bake as directed in the original recipe. Preheat oven to 350 degrees and lightly spray a 2 qt. baking dish with cooking spray. Mix drained green beans and corn in a large bowl with soup, sour cream, cheese and S&P. Evenly spread in prepared baking dish. Combine melted butter and crushed topping and then evenly sprinkle over casserole mixture. Bake for 30 minutes or until bubbly. Remove and allow to set for a few minutes before serving. ** Note, works really well to prepare a few hours to 1 night in advance before baking. this looks so delicious! i might have to make it. YUM!